Most investments fail but the few successful ones more than make all the money back — or so startup investors hope. But what sort of returns do these profitable exits bring in? According to a new analysis of all the exits listed in CrunchBase, the average successful company has raised $25.3 million, and sold for $196.8 million, for investor profits of 676% (if you assume the investors own 100% of the company, which they normally don’t). Meanwhile, IPO-bound companies generated lower percentage returns, but made a lot more money per exit. The average one raised $580.3 million while private, then went public with a market cap of $2.3 billion on its first day of public trading for 303% profit on investment (yes, investors probably aren’t selling all their stock on the first day, this is just one way to measure IPO exits). Mouse over the dots below for more details. The analysis, done by Belarus-based engineer and TechCrunch reader Alexey Tolkachiov with help from his brother Anton, looked at all CrunchBase -listed companies that had exits over the last five, and are ten years old or younger. So, these stats (which you can also find on their data analysis site, BuzzSparks) are squarely focused on the modern startup world. And that’s not the only qualifier here. As readers should note whenever we cover CrunchBase data, some company information it contains may be incomplete or inaccurate, even if it’s the largest free source for startup information in the world. Anyway, the analysis has also uncovered some other surprising trends in recent startup returns. Less surprisingly, more fundings occurred earlier on in companies’ histories. And while the number of acquisitions in CrunchBase only seems to go up slightly over the years as a company ages…. 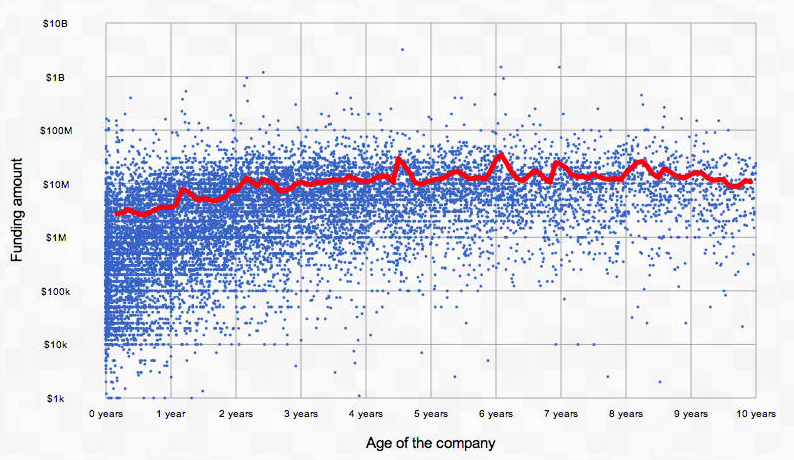 ….The acquisition price per employee appears to peak when companies are a little less than two years old, or four and a half years old, or a little over five years old. My guess is that a few extra lucrative deals are throwing things off here.